Nottingham Forest have signed defender Kelvin Wilson from Championship side Preston for £300,000. Forest and Doncaster had bids accepted on Friday and the Nottingham-born 21-year-old spent the weekend in talks with the City Ground side. He has signed a four-year contract and will train with his new team-mates for the first time on Monday. Big-spending Forest have already signed Neil Lennon, Matt Lockwood, Chris Cohen and Arron Davies this summer. 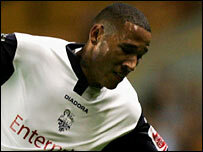 Wilson joined Preston from Notts County on loan in March 2006, signing on a permanent deal three months later. He made 78 league appearances at County, but started only 16 league games with Preston.